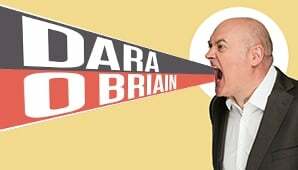 O Briain is a stand-up comedian, and television presenter, best known for BBC’s Mock the Week, Ireland’s The Panel, Stargazing Live, Robot Wars and Dara O Briain’s Go 8 Bit. It has recently been announced that Dara will be host of the re-booted classic quiz show Blockbusters, with two series due to be broadcast on Comedy Central in 2019. With a reputation for his stand-up world-wide, O Briain has sold out shows all over the UK, Europe and Australia. This is the chance to see one of the most charismatic, intelligent, fast-talking and downright funny live performers working today back in his natural environment! Don’t miss the brilliant and hilarious Dara O Briain! Hurry, tickets will sell fast!